Our next cultural meeting will be held on Friday, February 8, 7:30 p.m. at Mount Carmel Parish Hall, 3549 Navajo St., Denver. Dr. Roberta Waldbaum from the University of Denver will be presenting “Ethical Edibles: Visions of the Table in Italian Literature & Cinema”. In this talk, illustrated with clips from Italian films, she will discuss food imagery and how it provides both readers and movie viewers much “food for thought” to chew on. 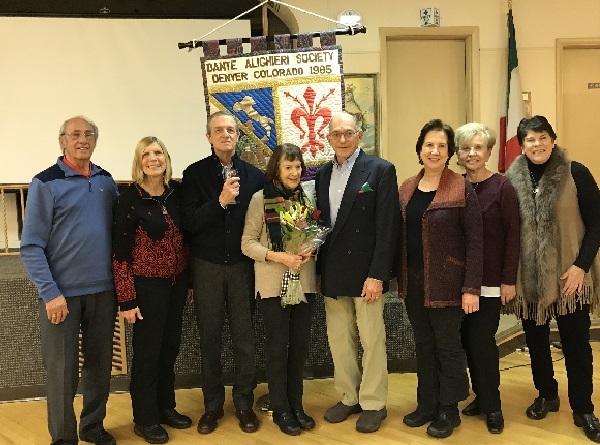 On Friday, January 11, the weather outside was cold and snowy, but inside Mount Carmel Parish Hall, it was warm, congenial and full of comradery as ex-president Gianfranco Marcantonio installed the elected officers for the term of 2019-2020: President John Giardino, Vice President Nick Napoli, Treasurer Carol Marsala, and Secretary Vera Buffaloe. The newly elected president offered his views on the future of the Society. He then thanked and presented past President Veronica with gifts of appreciation for an excellent job during the last four years. His committee appointments remain the same as in the previous administration: Suzanne Fasing (Education) Rhonda Hopkins (Membership), Gianfranco Marcantonio (Historian), and the addition of John Sadler (Scholarship). The committee did a fabulous job in serving pizza, drinks and a special cake for the occasion. The Society thanks the committee and wishes the new administration a very productive two years. 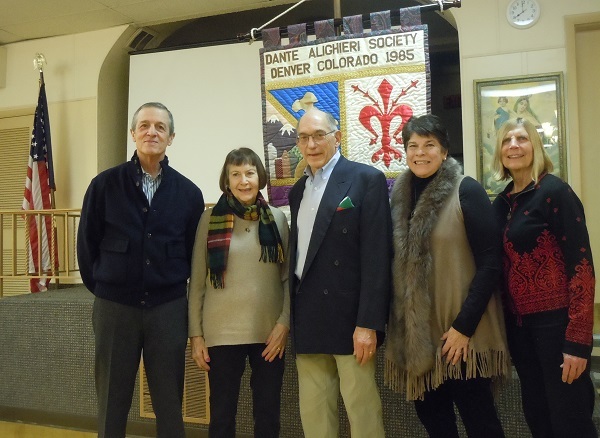 On January 11, I was honored to be sworn in as the new president of the Dante Alighieri Society of Denver. Over the past ten years as Scholarship Committee Chair, I had considered accepting the nomination for the president’s position but, frankly, I was comfortable in that old role. When the opportunity again came around to serve as president, I decided it was time to step out of my comfort zone and look at taking myself and the Society forward. 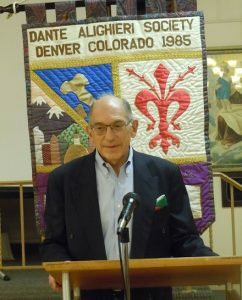 So, it is with great respect for those who began our Society, those who have kept us viable for almost thirty-three years and those who have created the potential for growth we currently possess, I humbly accept the challenge to lead the Dante Alighieri Society of Denver for at least the next two years. In my acceptance speech I talked about two areas where I felt we could grow not only a larger organization but a stronger one. 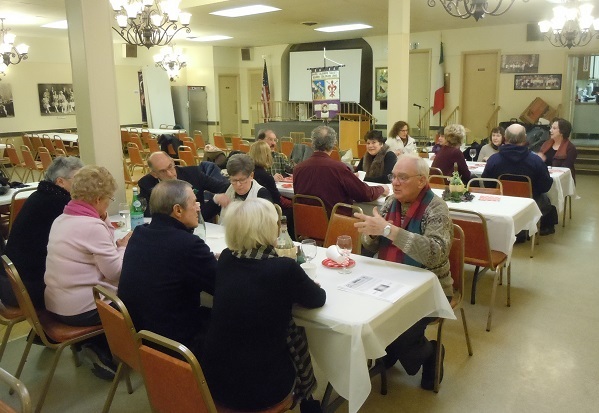 With the success of our Language Instruction Program, we now have access to a number of people who are interested in at least one part of the Italian culture. With cultivation, I feel we can work with the program to expand students’ interests beyond just the language portion of the Italian culture, hopefully becoming active Dante Society members. Classes will again be held in the Mt. Carmel Parish Hall kitchen from 9 am until noon. Each session will cover three courses: antipasto, primo e secondo piatti, e dolce. The January 26 class will feature classic handmade pasta. Students will first prepare traditional pasta with semolina flour and then a second pasta using a gluten-free grain. The February 9 class will feature food traditionally prepared for the Carnevale celebration. The February 23 class will feature the traditional menu for Easter Sunday dinner. Because of limited kitchen space, class size will be limited to 12 participants. Priority for registering will be given to Dante Alighieri Society members of record. Due to popular demand, registrants must choose one preferred class. Fee per class is $50, payable by check, made out to Dante Alighieri Society of Denver and mailed to Vera Buffaloe, 13778 W 62nd Drive, Arvada, CO 80004. Registration is currently available for February 9th and February 23rd classes. Jan 26th class is full. To reserve a place in one of these classes, either telephone Vera at 303-886-0608 or email her at buffaloev@gmail.com . MEMBERSHIP COMMITTEE It’s that time of year again. Membership renewal cards went out at the end of the month of December. I hope you will join us for another year of interesting lectures, movies and fun. Please review the information on the card and make any corrections before mailing it back to me with your payment. ATTENTION STUDENTS! If you plan to continue taking language classes in 2019, it will be necessary for you to renew your membership regardless of when you joined the DAS. Please pay for your class and membership at the same time. If I receive payment prior to mailing the renewal cards, I will not send a card to you. Instead I will check your current information from your registration and fill the card out for you. 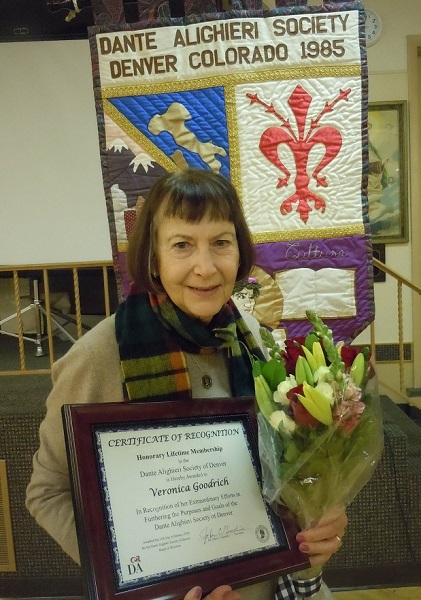 Grazie, Rhonda Hopkins, Membership Chairperson. 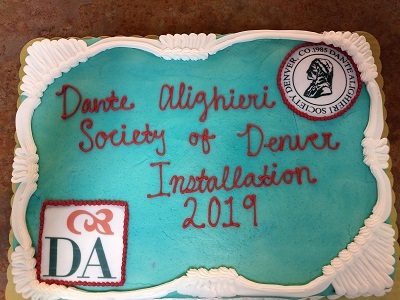 The Dante Society of Denver gives a warm welcome to the latest members: Kristi Blanshan, Jaime Egan, Anna Marie Ferrari, Andrew Hagen, Estefany Hernandez, Lesley Leach. Jeanne Liotta, James LoBello, Dante Mazzari, Ann Parker, Katerina and Joseph Pietrafeso, Lorraine Reid, Blas Rubi, Molly Schaefer, Kathleen and John Shea, Lisa Tadiri, Mark Thompson, Colette Wagner, and Pete Winterscheidt. ITALIAN LANGUAGE CLASSES SPRING SESSION BEGINS MARCH 25, 2019. A follow-up reminder notice has gone out to local higher education institutions concerning the 2019 Dante Alighieri Society of Denver Scholarship Program. The deadline for students to submit their applications is April 20, 2019. Mark your calendars now for the Scholarship Luncheon on May 5, 2019 at the Arvada Center. DON’T FORGET TO RELOAD YOUR KING SOOPERS GIFT CARD. The Dante has received over $1,000 toward our Scholarship Fund through the King Soopers Neighborhood Reward Program. A hearty thanks to our members and friends who have reloaded gift cards purchased through the Dante Society. If you don’t have one yet, we’ll have some at the next Dante function or contact Veronica Goodrich 303.421.1547 or Carol Marsala 303.237.0688. Initially loaded with $25, Dante only gets credit when you add $$ to the card at checkout (or customer service). It’s painless, and oh, so rewarding. Italian homes in scenic Sicily are on sale for just over a dollar. A stunning Italian village in Sicily is offering prospective buyers a deal of a lifetime — a villa with a price tag less than the cost of an espresso. Sambuca for a dollar — this could be the destination real estate deal of 2019. Local officials on southern Italy’s island of Sicily have put dozens of hilltop homes on the market for €1 ($1.60). Yes, that translates to just over one Australian dollar — for villas with panoramic views of the Mediterranean on a fertile patch of land dubbed the “Earthly Paradise”. This shocking real estate proposition is aimed at reviving a community that, like many other rural spots in Italy, has suffered from depopulation in recent years as locals relocate to metropolitan areas. There is one catch: The homes are dilapidated and prospective buyers are obligated to invest $17,000 in a refurb within three years. (Yes, you will have to pull a full-on “Under the Tuscan Sun” number on your new joint, a la Diane Lane.) Sambuca’s not the first Italian town to tease outsiders with seemingly too-good-to-be-true offers, officials admitted to CNN — but they are the first to minimize red tape so anyone interested can make their purchase ASAP. The charm of the city also lies underground in its “sunken city” where Mr. Cacioppo organizes guided tours. He said the real estate has already started to draw a lot of international interest. “Foreigners are flocking here, flabbergasted by all this beauty,” he said. While it will take some work to get the homes back to their former glory, Mr. Cacioppo says he hopes the newcomers will help breathe new life into the town. In an interview with CNN, German resident Susanna Heinson has already purchased a house and restyled it. 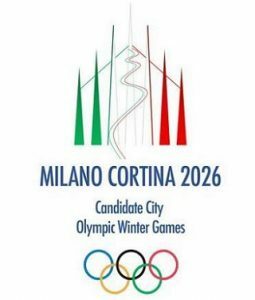 Olimpiadi Invernali 2026, Malagò presenta la candidatura di Milano-Cortina. Tokyo, 28 novembre 2018 – Una montagna tricolore a forma di Duomo con al centro una pista da sci è il logo che Giovanni Malagò, molto emozionato, ha presentato a Tokyo, ai comitati olimpici mondiali, per la candidatura italiana di Milano-Cortina ai Giochi invernali 2026. Il presidente del Coni, insieme al sindaco di Milano, Giuseppe Sala, al presidente della Regione Veneto, Luca Zaia e alla campionessa olimpica, plurimedagliata di Short Track, Arianna Fontana, hanno parlato agli oltre 1.000 delegati di tutto il mondo durante l’Assemblea Generale dell’Associazione dei Comitati Olimpici Mondia li (Anoc). Giovanni Malagò: “La nostra è una candidatura che parte dal territorio, nel pieno rispetto dell’agenda 2020 con la quale il Cio ha dato le linee guida dei Giochi del futuro: sono sicuro che il sogno di Milano-Cortina 2026 diventerà realta’. Per questa prima presentazione sulla scena internazionale della candidatura Milano-Cortina ai Giochi Olimpici e Paralimpici Invernali 2026, i relatori italiani sono stati affiancati anche dai membri italiani del Cio, Mario Pescante e Ivo Ferriani, il segretario generale del Coni, Carlo Mornati, e Diana Bianchedi, coodinatrice della candidatura. 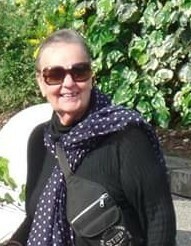 Dopo la presentazione di Milano-Cortina, durata una ventina di minuti, è toccato a Stoccolma, unica rivale. GOOD NEWS AGAIN FROM ROME AND THE VATICAN FOR YOU TRAVELING TO ITALY in 2019. Once again, the agreement between the Vatican and the Dante has been renewed once again for the year 2019. It allows us to visit the museums at a lower price and get in front of the long lines simply by presenting the Dante Society membership card. The cost to visit the Museums is 16 euros per person, and 1 euro if you decide to purchase the Art and Faith DVD on the Treasures of the Vatican. The Dante membership card may be obtained by contacting Rhonda Hopkins at 720-596-4169, rhop626@gmail.com, or Gianfranco Marcantonio at 303-494-3080 glm3942@yahoo.com .